I am implementing a new template at the moment on my Munster Business Web Site which I will be rolling out to all the pages in the site. This is a design using a creative commons CSS. This is an example of what you can achieve without any expensive design costs! All thats required is that you keep the licence info at the bottom of the page. 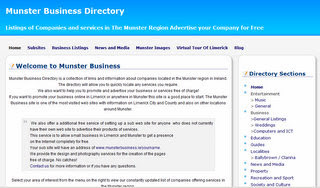 The Site will continue to offer Free Business Listings to any company based in the Munster region or offering services into the Area. So to advertise your company for free in Munster make sure you visit us.